* Test out and introduce prototypes. It is not uncommon for a company’s marketing department to spend several months preparing for participation in a trade show. Anyone who has exhibited at a trade show can confirm how hectic it can be. A great way to involve your customers and business partners in your show preparation journey is to photograph and post on social media your entire experience, start to finish . Don’t forget to have fun with it! Tell your company’s story along the way and demonstrate why you’re exhibiting. Blast it on your social media outlets, mostly every trade show has a hashtag, and make sure you use the correct one. Be consistent with the hashtag, and use it is in every post regarding the upcoming trade show. Show the human side of your company, it is not ran by robots! Trade shows are field trips for working professionals, and they do not need to be so serious all the time. A fun idea to do, is to come up with a contest or game. Designate one person from your team to be in charge of this operation. Make sure they have a decent camera, and set them up with their own personal lap top or tablet. Even if this is their only job at the trade show, it will be well with it. After you start building a hype about the trade show you’re exhibiting at, start photographing how your team is preparing at the office. Take pictures of your team putting brochures in boxes, or of the team members who are going to the trade show. Showcase an exclusive behind the scenes of production and what everyday life is like at the office. Whether you’re flying or driving to the trade show capture your traveling experience. Usually, the organizers of the trade show will have some type of social event for the exhibitors. Take appropriate pictures in the laid back non-work environment. When the trade show begins get pictures of your teammates interacting with your attendees. An easy way to get pictures is to set up a fun and catchy photo booth section, and maybe even provide a prop relevant to your company. Tell your attendees they can find their picture on your social media outlets, and give them something tangible with your company information. If you have anything unique at your booth, for example refreshments, couches or charging stations, definitely showcase and promote that through your social media. In order to make a lasting impression to your potential customers, you want to provide an unique experience. Give your company an identity, and the best way to do that is through pictures. While exhibiting at a trade show you want to be able to draw in a crowd and stand out. Remember, you’re exhibiting in front of your potential customers and your competitors are in the same building. The second thing to remember, is that you have an audience outside of the trade show environment. By creating a visually interactive experience both at the trade show and online, it will not only help to boost sales but also increase your brand awareness. Author: Kristyn Habercross is the marketing manager for Defined Exhibits. 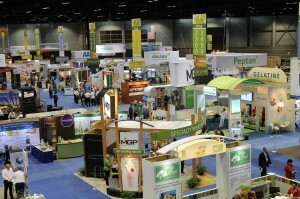 Defined Exhibits provides world wide exhibit solutions for tradeshow and marketing communications.